Ever hear of Pure Piper? Neither had I until the company recently sought me out, asking if I'd be interested in trying their new A2 device. They found me at a good time when I happened to be (briefly) all caught up with reviews, and their pricing ($269) seemed very reasonable. So I agreed to give it a shot, making no promises as to what the result might be or if I'd even publish a write-up at all. This is actually pretty standard for me - I get a LOT of gear passing through that I don't end up writing about, for various reasons. While the review unit was in transit, I did a little research on the brand and found this review from back in 2010. 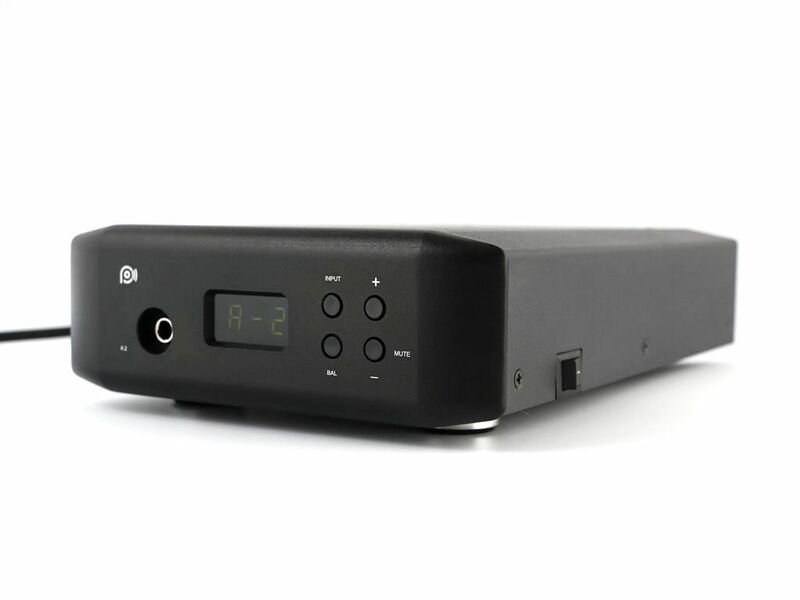 The A1 was the first DAC released in the North American market, sans headphone output or preamp capabilities, but otherwise having a lot in common with the A2. 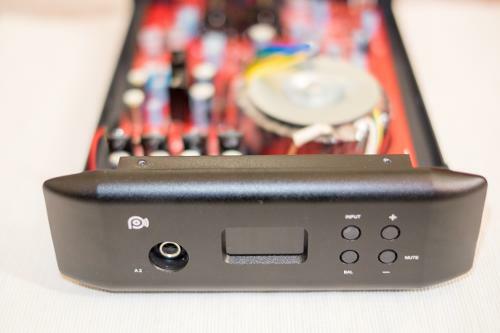 Their claim to fame was a discrete output stage and excellent value for the money, including a more substantial enclosure than what we usually see for around $200. That was back in a time where a company could get away with releasing non-USB capable devices. Those days have passed, and the new A2 is somewhat more modern. I say "somewhat" because the device still keeps it simple. Apologies to Schiit Audio for using one of their slogans, but there's a distinct lack of "buzzword compliance" here. 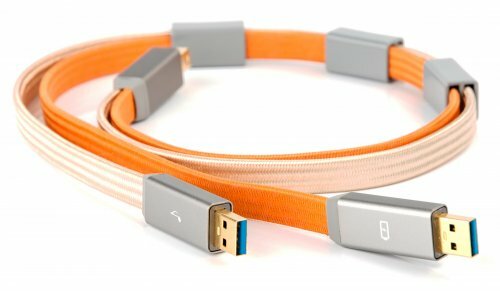 USB runs in adaptive mode and tops out at 24-bit/96kHz - a far cry from the recent parade of DSD and 384kHz capable models. There's also coaxial and optical digital inputs along with a 3.5mm analog input for connecting a smartphone or tablet. Outputs are single ended only, as expected in this price range. We do get separate jacks for fixed and variable output which is not something I see all that often in DAC land. Up front, a 1/4" headphone jack flanks the small 2-digit LCD display and a set of 4 buttons. Two buttons handle volume up/down, one cycles inputs, and one is used to activate the "balance" option, for adjusting left/right balance on the headphone output. Again, not something I see very often, nor something I have any particular use for. Internally, the A2 is reasonably capable. DAC duties are handled by the Cirrus Logic CS4398 - again, no buzzworthy Sabre chip on board. 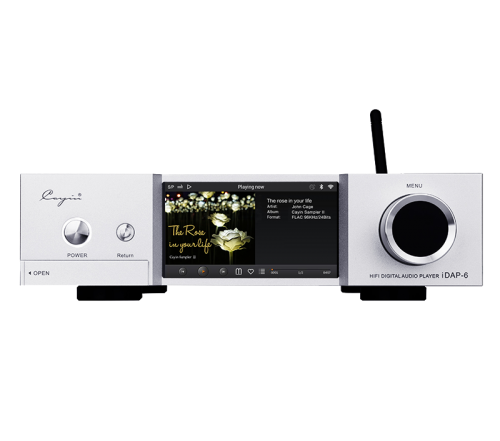 Digital inputs are handled by the venerable Cirrus CS8416 while the USB transceiver is a Bravo SA9023. The Bravo is a somewhat rare 24/96 capable budget chip about which very little information is available. However, based on what I could find, this solution is superior to the competing Tenor TE7022 in every category: better jitter rejection, support for the 88.2kHz sample rate, and improved interfacing with digital audio receivers. As such, this affordable chip is a great choice for a budget design like this, where many others still use the old Tenor solution. Interestingly, the A2 is one of the few devices I've encountered to reliably accept 176.4kHz and 192kHz over Toslink. Most DACs top out at 96kHz when using optical. So, while USB is limited, both SPDIF inputs can go all the way to 192kHz, if that matters to you. 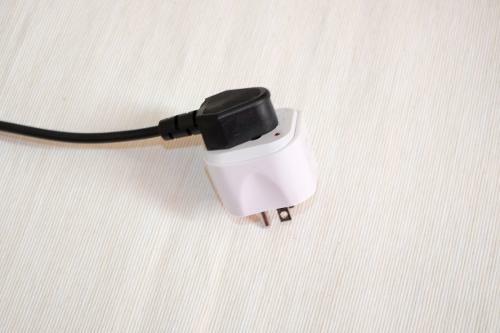 The power supply is a linear design complete with torroidal transformer, which is not often found in this price range. 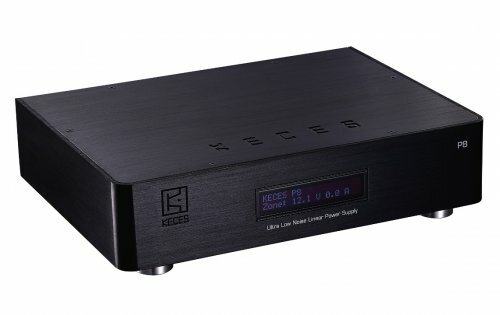 A lot of budget DACs simply don't have the real estate to handle a linear power supply, so they opt for an external power brick or wall wart. This one aspect is likely responsible for the difference I hear between this device and so many other budget contenders. 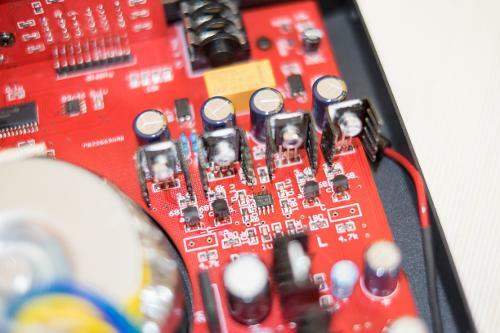 I'm reminded of the excellent Parasound Zdac and Zdac v2, both of which are based around a beefy power supply despite their relatively compact size. The Parasound models are similar to the Pure Piper in that they may not have the latest and greatest USB implementations, but nonetheless prove worthwhile due to their solid grasp of design fundamentals. 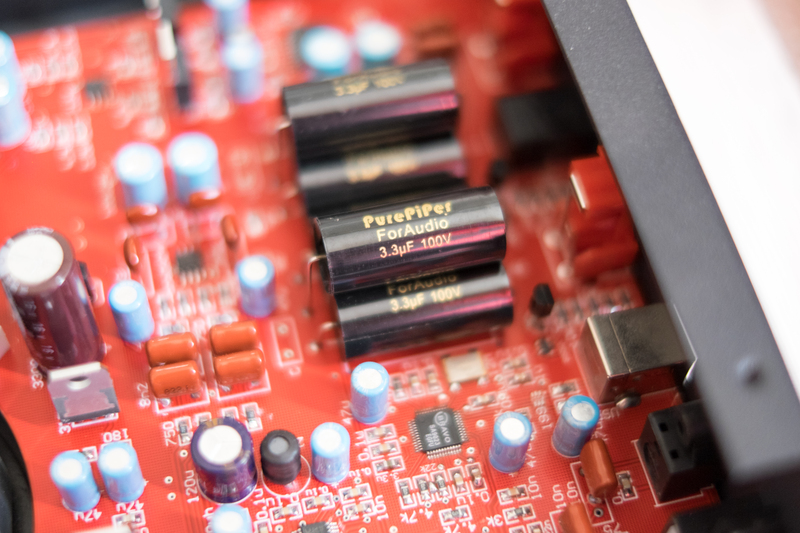 Pure Piper uses a Cirrus CS3310 digital volume controller which should theoretically be superior to the on-chip scheme of the CS4398. This chip lies in the signal path of the "variable" line-out and the headphone amp, but not the "fixed" RCA output. The A2 uses opamps such as the OPA2134 and OPA2604 for low pass filtering and I/V conversion, with a capacitor coupled output stage using large Pure Piper branded caps. 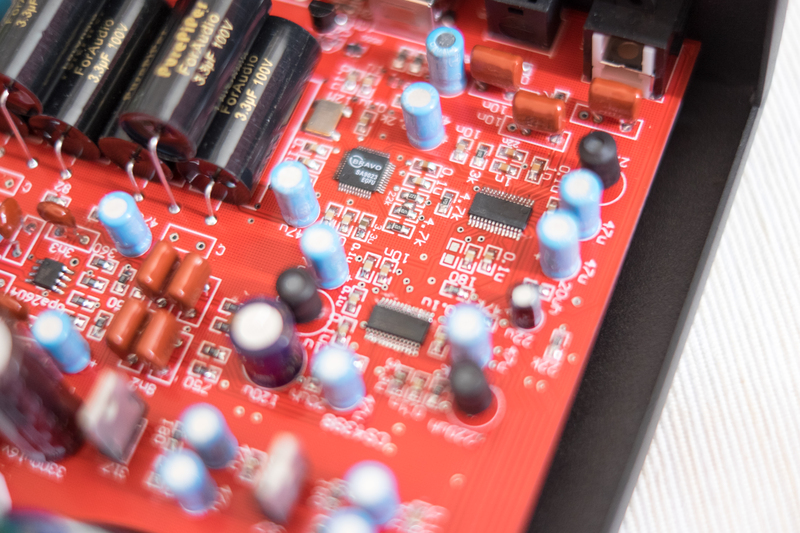 Headphone output is a classic NE5532 driving a discrete transistor buffer. Output impedance is around 4.5 ohms, so there may be issues driving some IEMs due to impedance related interactions. 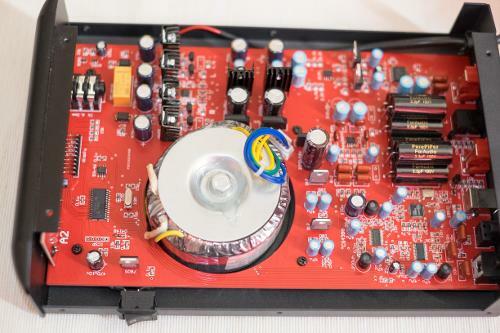 The amp tops out at nearly 2W at 32 ohms so most headphones should be very comfortably driven. Build quality on this thing is surprisingly good. It's not flashy, but in a way still looks like a more expensive device. It helps that many in this price range are really compact or else just look like toys, while the A2 has a proper enclosure and is larger than most. It really is built like the proverbial tank, reminding me somewhat of the original Matrix M-Stage headphone amp, or the Apex Peak/Volcano combo I used to enjoy so much. The only evidence I find of cut corners is the captive power cord. Since the device uses a linear power supply rather than the usual switch mode solutions often found in affordable DACs, it's more complex to offer universal voltage. So the unit is designed to work with 210V-230V wall power only, and the cord can't be replaced. Instead, Pure Piper sent the A2 along with a small voltage converter to allow use in my region. I'm not sure if that's a common thing they always do or if it's special for the review. It's a little cumbersome but gets the job done well enough. Now, on to sound. The Pure Piper A2 is surprisingly capable for a sub-$300 device. It's got a dynamic, full-bodied presentation that remains detailed and thoroughly engaging. I'd call this a "musical" sound without the negative connotations that word can sometimes bring. Low end heft and extension are more convincing than most of the affordable DACs I've tried. There's a slight bloom involved, so don't expect strict neutrality, and the level of control isn't on par with something like a Resonessence Labs Concero (which, to be fair, costs roughly twice as much). But I think most people would really enjoy the end result here. Mids are thick and rich, while upper mids and highs seem very slightly accentuated. It's just a slight boost, small enough to go unnoticed at times but also to add drama with certain music. The highs do seem a tad rolled off in the extreme upper registers. It's enough to notice missing "air" as compared to higher-end sources, but not something I would complain about in general. Overall it's a crowd pleasing signature which works well with the majority of music I throw at it, being something like a junior version of the Matrix X-Sabre thanks to its exciting sound signature. The Pure Piper isn't as refined but again that's to be expected considering the price discrepancy. The fixed outputs sound pretty much identical to the variable output, so apparently the volume controller chip placed in the signal path has no audible impact. That, or the device just isn't transparent enough to show a difference. I listened long and hard for this - I expected at least some small difference to rear its head at some point. I thought I might have heard it initially, but it vanished whenever I tried to nail it down. So, bottom line, both outputs sound close enough to be indistinguishable. And I actually like having both outputs available. I threw the device in a desktop rig using a pair of Serene Audio Talisman powered speakers connected to the variable output, along with a NuForce HA-200 headphone amp being fed from the fixed output. This might be a somewhat uncommon setup, but the A2 allowed it to happen.... so I won't complain. Without the multiple outputs I would not be able to accomplish the goal. One thing I noticed about the DAC section of the A2 - it is very susceptible to transport quality. This is something I used to find quite prominent back in the day, which has somewhat lessened on modern DACs. Especially those with quality USB inputs. I no longer think asynchronous USB is a magic bullet, as it was originally purported to be. 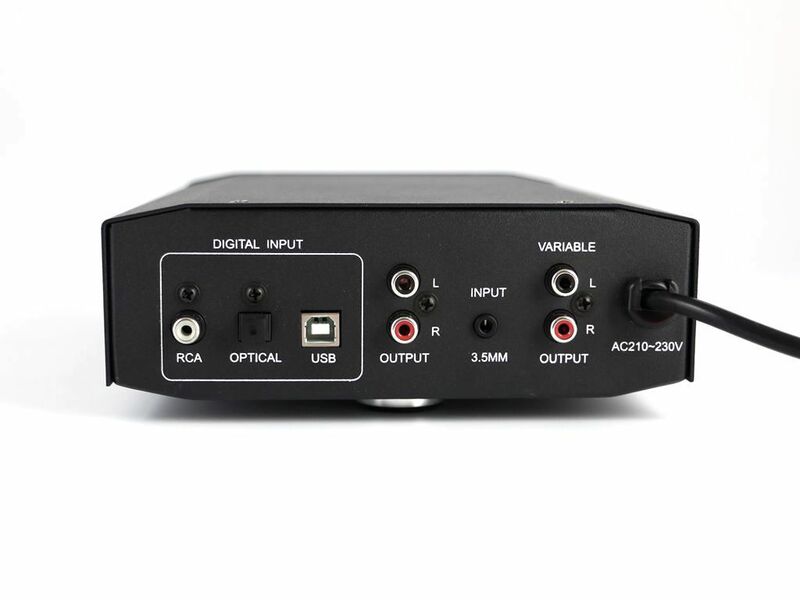 However, modern DACs tend to sound at least "pretty good" even with basic USB signals from any old computer. DACs like the A2, using adaptive USB and lacking any specific jitter reduction techniques (ASRC or FPGA for example), remain highly transport dependent. It does better with my Surface Pro 3 than my cheap little Acer laptop, and better still using a dedicated server such as the B.M.C. PureMedia or Aurender X100L. SPDIF is just as sensitive - it likes my YBA Design CD player as transport quite a bit more than my basic Sony Blu-Ray player. The aging CS8416 is not the best DIR for jitter reduction, and the Wolfson WM8805 or TI PCM9211 would have been superior alternatives. But a lot of designers seem to prefer the old 8416 for some reason.... I've heard much talk of it having a more "musical" sound to it, so perhaps it was chosen in spite of the other (technically superior) options. 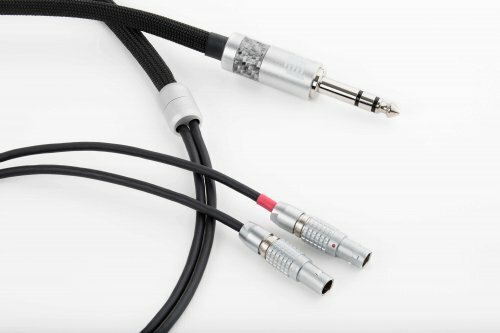 The A2 would very likely respond well to jitter reduction devices like the Audioquest Jitterbug, Uptone Regen, iFi iPurifier, et al. I don't have any of those specimens on hand at the moment, so I'm basing that assumption on the results I get using a DDC such as a Resonessence Labs Concero or Audiophilleo 1 with PurePower. Obviously those are both overkill considering the cost, but the point remains that "decrapifying" the incoming signal pays dividends with this device. The amp section drives most headphones with plenty of juice. 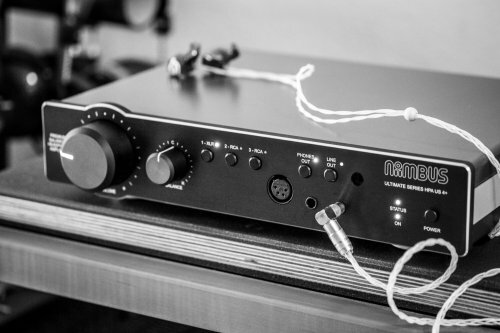 Planars like the LCD-2 and HE-500 hit with characteristic authority, showing the benefit of this powerful amp stage. Dynamic headphones like the AKG K812 and Ultrasone Edition 12 also show increased punch which may or may not be a good thing... at times I felt like it made things more exciting, while other times it went a bit too far. I'd say the integrated amp section is also warm and exciting, similar to the DAC - meaning the combination ends up being a bit much at times. It does a credible job 90% of the time, with most music and most headphones. But I did notice an unpleasant "tizz" which shows up on certain female vocals. Folk singers Alison Krauss and Abigail Washburn, two of my favorites, are not very enjoyable with the AK T5p, AKG K7XX, Ultrasone Edition 12, or any number of other headphones. Same with Canadian singer/songwriter Chantal Kreviazuk - I've never heard her sound sibilant like this before. Darker models like Sennheiser HD650 are more palatable but still not ideal. It's odd because, using the same problem-inducing headphones, I can still enjoy other female vocalists (Kristin Andreassen, Thao Nguyen, Aoife O'Donovan, Sarah Brightman, etc) without a hitch. They may have an accentuated presence in the vocal range but that sibilance is nowhere to be found. So, apparently it's a case by case thing. Unfortunately, the headphone amp is not a good match with sensitive IEMs. There's an unavoidable hiss which is overpowering, and the output impedance isn't a good match anyway. So scratch IEMs off the list. I do not hear any hiss with full size headphones, no matter how sensitive. Ultimately the Pure Piper A2 is a satisfying if somewhat unremarkable device, and I mean that in the nicest possible way. It's strength ends up being its lack of significant drawbacks, where many entries in this range have one or more glaring flaws. The build and appearance of the A2 are quite good for the money. And the powerful headphone output is more impressive than most other budget integrated DAC/amps I've experienced - especially with planar magnetic headphones. A solid argument could be made that a majority of a system budget should go towards the headphones themselves, with ancillaries being a distant second. Following that logic, I'll happily recommend the A2 as paired with an HE-560 to name just one example. Are their better devices to be found? Of course, though none currently come to mind in the sub-$300 range. Pure Piper may not be a well known player in the North American Market and honestly I don't think this device will change that situation much - but the A2 shows me they can make a solid product for a very reasonable price. 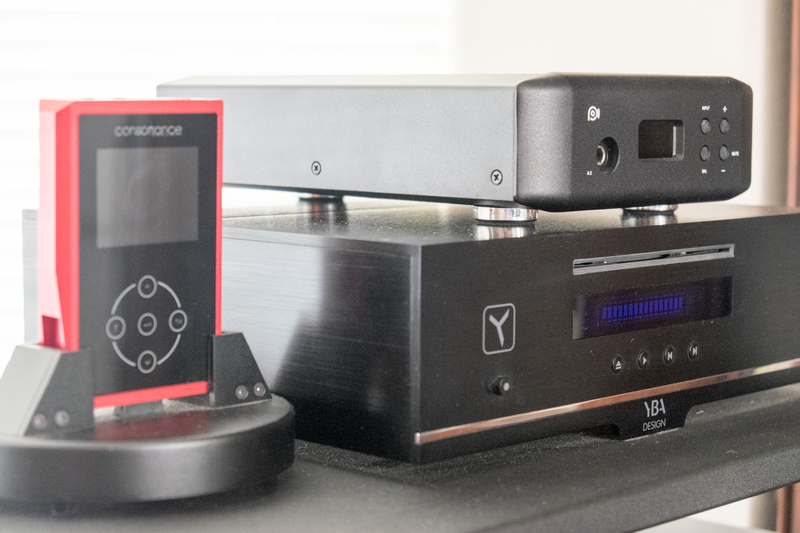 A quick browse their website reveals much more than the A1 and A2: I see some far more advanced DACs, some big Class A amps, preamps. speakers, cables and various accessories, and even some headphones. Looks like they have a full line of gear that isn't currently available outside their home market. If the quality of the A2 is any indicator, perhaps they should reconsider their distribution. The company seems to have recently started selling on eBay which is where you can purchase the A2 if you find yourself intrigued enough to give it a shot. This looks like a real promising product for people like me on quite a strict budget, thanks!